Explanation: If this is Saturn, where are the rings? When Saturn's "appendages" disappeared in 1612, Galileo did not understand why. Later that century, it became understood that Saturn's unusual protrusions were rings and that when the Earth crosses the ring plane, the edge-on rings will appear to disappear. This is because Saturn's rings are confined to a plane many times thinner, in proportion, than a razor blade. In modern times, the robot Cassini spacecraft orbiting Saturn now also crosses Saturn's ring plane. A series of plane crossing images from 2005 February was dug out of the vast online Cassini raw image archive by interested Spanish amateur Fernando Garcia Navarro. Pictured above, digitally cropped and set in representative colours, is the striking result. 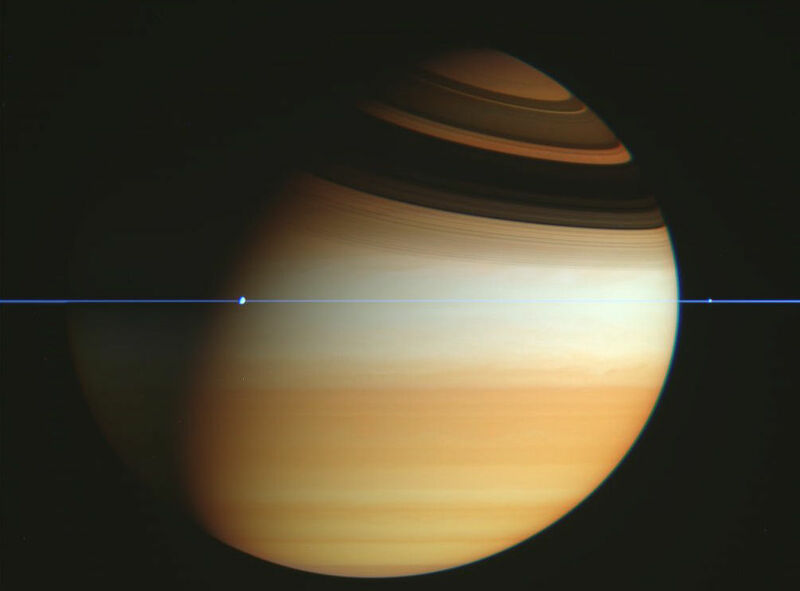 Saturn's thin ring plane appears in blue, bands and clouds in Saturn's upper atmosphere appear in gold. Details of Saturn's rings can be seen in the high dark shadows across the top of this image, taken back in 2005. Moons appear as bumps in the rings.